Official Answer: It is not certified Kosher for Passover. Unofficial Answer: It’s kosher for Pesach. Pure maple syrup can’t have additives, if it has them, it is not allowed to be called “pure” maple syrup. 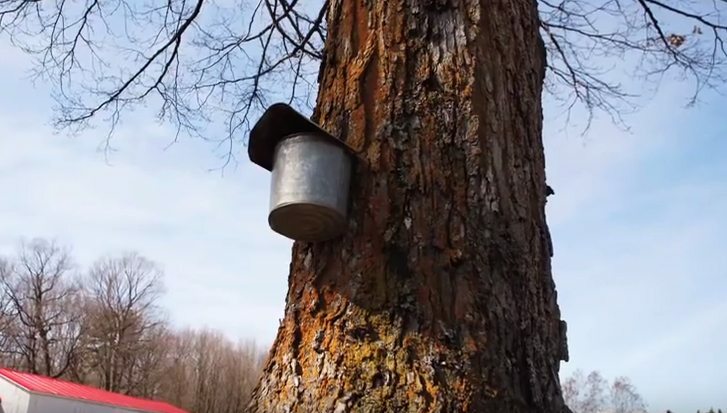 Maple syrup is made by tapping trees, gathering sap and then boiling off the water in the sap to make the syrup. 40 liters of sap gets boiled down to make 1 liter of syrup. During this boiling process, foam is created- and the foam can ruin the syrup making process. To reduce the foam, a “defoaming” agent is added to the mix. In organic maple syrup it can be either sunflower oil (which is kitniyot) or safflower oil (which is kosher for passover). In non-organic syrup is it something called “Atmos 3000” which is made up of: Mono and Diglycerides, Propylene Glycol, Propyl Gallate and Citric Acid. The Atmos 3000 is kosher and the ratios being used are also apparently in our favor. I am told that there is too little being used to matter (according to the halacha). In organic syrup, you have 0.2 – 0.4 mL of the sunflower or safflower oil being used. The ratio of defoamer to syrup is 1 part per 20,000-40,000. I am not a rabbi- I don’t understand the halacha as well I should. I will be “selling” my syrup along with my hametz just to be safe- but next year I will be going into this in greater detail and MAYBE I will be saying something different. If you have the halachic background, you can make your own determination for this upcoming Pesach.